off the flame. Garnish with mix nuts and serve hot. Nice dessert Preethi, and also no problem with adding the pictures to your facebook page.. 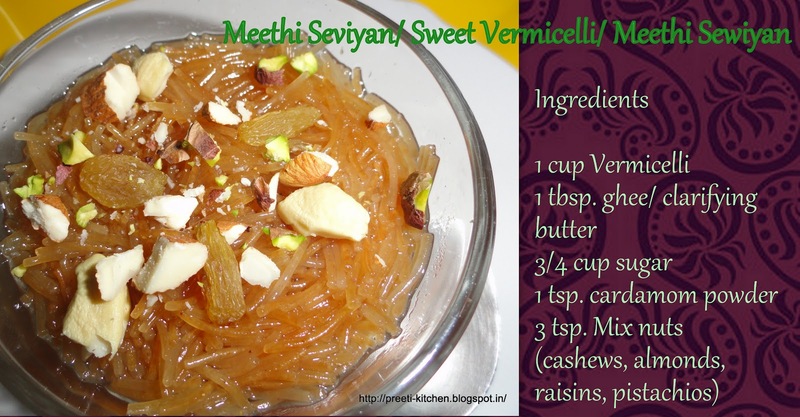 Very nice vermicelli..looks good preeti..
Looks yumm.Love this sweet, make it sometimes for the kid and for a royal treat I add kevra or gulabjal too. looks easy to make ..might try it!!!.. If i do, will let you know here!! Loved the golden brown color of seviyan. We make Methi Seviyan on raksha bandhan as a offering to shravan kumar. Love the colour. Looks delicious.